SKU: N/A. 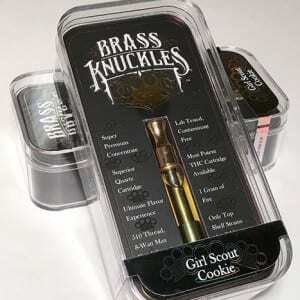 Tags: Blueberry, Brass Knuckles, Brass Knuckles Blueberry Cartridge, Brass Knuckles Cartridge, vape cartridge. Blueberry is a heavy indica-leaning strain that’s popular for its flavor and strong genetic ancestry. A 3-way cross between the landrace strain Afghani X Thai X Purple Thai, it was originally developed by DJ Short, a famous yet mysterious breeder back in the 80s. Blueberry is a premium cannabis strain. Its reputation soared when it won the High Times’ Cannabis Cup in 2000 for best Indica. Its highest THC content as recorded by tests is 24%. Blueberry combines the sweet flavors of fresh blueberries and spicy, musky aromas that are typical of Afghani varieties. Blueberry is notably potent, as it is known to posses the ability to stun even experienced cannabis users. It strikes fast with a feeling of physical stone and could leave users sedated or couch-locked if used in high doses. Its sativa composition provides a mild euphoric uplift and cerebral stimulation—an effect that make smokers chatty and giggly. Blueberry treats both short-term and long-term chronic pain that may occur due to disease or injury. Its potent sedative effect induces deep and lasting sleep, making it an excellent strain in the treatment of serious cases of insomnia. Blueberry will also help mental conditions such as stress, anxiety and depression. Blueberry treats both short-term and long-term chronic pain!!! !